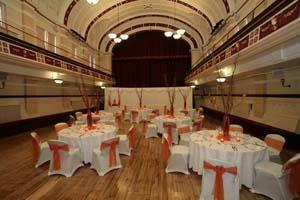 Why not celebrate your special occasion in Pontefract Town Hall, an 18th century architectural jewel of timeless elegance located in the heart of the town’s ancient historic centre. Restored to its original magnificence it offers a stunning and breathtaking venue for those seeking a dignified and practical setting for a unique occasion. There are two rooms available for hire. The first and slightly more intimate room is the Nelson Room, so called as it features the original plaster cast frieze used for Nelson’s column in Trafalgar Square. This room is perfect for ceremonies with a capacity of 110. The second, larger, but equally dramatic room is the Assembly Hall, which is a flexible, stylish space ideal for live entertainment and evening celebrations accommodating up to 150 guests. Our Events and Functions Team will be dedicated to making your day very special. To arrange a viewing and for further information please contact the team on the details below. Located in the town centre of Pontefract on Market Place. Take junction 32 off the M62 and follow signs for the town centre.